It’s been a privilege getting to know the incredibly talented author Angela D’Onofrio this past year. Ang and I met, like so many authors do, through the #Twitterverse, striking up a fast and growing friendship. As the creator of #2bitTues, a hashtag of influence, Ang inspired me to create my own #Thurds Words. Both tags appeal to writers, bloggers and poets with that one thing in common: a desire to express and share. Ang’s first novel FROM THE DESK OF BUSTER HEYWOOD is a fascinating fish out of water tale with a twist: the unsavory thing in the trunk is the ticket to belonging. Winner 2nd Prize “Thriller” 2016 Summer Indie Book Awards (Metamorph Publishing), she is full of energy, releasing earlier this month, her sophomore effort IN THE CARDS. Aviario, Connecticut will never be the same! Congrats, Ang. This past summer, Ang did an amazing thing, posting on her blog, an awesome compare/contrast piece of my two books. In it, SCOOTER NATION and HEUER LOST AND FOUND are examined closely, and I was blown away by her observations. With Ang’s permission, I am reproducing her piece here with the hope that I can do a similar piece for her very soon! Thanks, again, friend, for your tips, your generosity and your commitment to this thing we do called writing. Those of you who have been following my blog for a while will remember A.B. 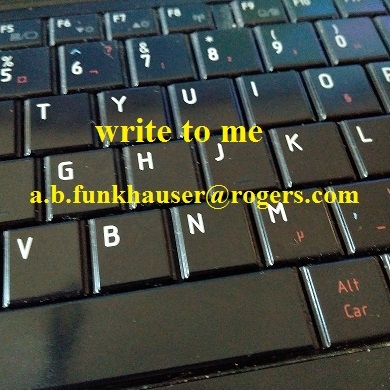 Funkhauser’s name, as she was kind enough to interview me back in February about From the Desk of Buster Heywood. At that time, I had already read her debut novel, Heuer Lost and Found, and known I’d found a new favorite author. Funkhauser’s Unapologetic Lives series follows the surprisingly zany ins and outs of the Weibigand Funeral Home. I was expecting eclectic humor on par with Carl Hiassen and Christopher Moore … I got that, and far more. The lost Heuer in question is Jürgen Heuer, a lawyer whose life was about as unapologetic as anyone’s can get. Rude, lewd, and thoroughly self-serving, Heuer despises his neighbors and alienates his colleagues. So when he dies in an apartment that would make episodes of “Hoarders” look tame, it takes a good, long while for anyone to notice he is missing… much to Heuer’s dismay, as his spirit still remains, kicking around the apartment and forced to come to terms with the life he lived. With a little bit of horror, just a dash of magical realism, and a lot of heart and humor, Heuer Lost and Found teaches us that there is beauty to be found everywhere, as long as we still have the will and the eye to look … and that it is never, ever too late for a soul to redeem itself. Scooter Nation brings us ahead in time, to a year after the events of Heuer Lost & Found. Carla and Enid have both recovered as much as they can from what they endured, and have been joined at Weibigand’s by Carla’s old friend Scooter Creighton. I think that “old coot” would be the most fitting label for Scooter, and I apply it in as endearing a manner as possible. The scheme Jocasta Binns has been brewing comes to full fruition: the funeral home is sold out of its generational ownership to a chain, and the repercussions of the sale shake every member of the Weibigand’s staff to its core. The more liberties Jocasta takes with the home, the more her employees fight to keep their own integrity intact… and eventually, desperate times call for desperate measures. Weibigand’s isn’t the only place having trouble with its status quo, however: a gang of motorized scooter owners is becoming more and more vociferous about their right to full access. Their ringleader, Alma Wurtz, is the worst of them, with a personal vendetta against Jocasta Binns. Scooter and Carla make an alliance with her in an attempt to save the dignity and decorum of the trade and the home they have come to love over the years, and the death of a public figure provides the perfect opportunity… but will they go too far? I came into this novel expecting something on par with its predecessor, and was not disappointed in the least. The characters who were so full-fledged and rich grow and develop by leaps and bounds, especially when pushed to their boundaries. Funkhauser digs down deep into each character and shatters the lines of morality, showing us the darkness and light within all of them… and forcing us to take a good, hard, look at it ourselves as we decide, as readers, who we should really be cheering for. It is a difficult decision, in the end, and I think a second read is in order to really decide. There is not quite as much in the way of magical realism in Scooter Nation: no spirits or sage advisory objects … but the spirits of Weibigand’s are still very present in the imprint they have left upon the people who remain. In the midst of death and chaos, life endures … unapologetic, plain, beautiful, and crazy. To be reminded of that should be the goal of every good book, and Funkhauser passes that test with flying colors. You can acquire Heuer Lost and Found and Scooter Nation here, on Amazon.com. To read more about the author, please visit her website, or follow her – as I do, happily – on Twitter.